The Constitutional Convention was held between May and September 1787 in Philadelphia, Pennsylvania to deal with the glaring weaknesses with the Articles of Confederation. Rather that revise the Articles of Confederation, the delegates at the Convention quickly decided to replace it with a new constitution. Famous patriots in attendance included Benjamin Franklin, James Madison, John Jay, Alexander Hamilton, George Washington, George Mason. Absent were John Hancock, Thomas Jefferson, John Adams, and Patrick Henry. With George Washington presiding, the 55 delegates met in secret in Philadelphia and drafted a new document. Rather than revise the current Articles, Madison promptly declared that any confederacy was doomed to failure. The Constitution was approved by Congress and sent to the states for ratification. After intense debate all 13 states ratified (some with the provision that a Bill of Rights be added) and the new government took office in March, 1789, with George Washington as the first president. The original 55 delegates were from the following Christian congregations: 26 Episcopalian, 11 Presbyterian, 7 Congregationalist, and 2 each who were Roman Catholic, Lutheran, Dutch Reformed, Methodist, and Quaker, plus Benjamin Franklin. At the time the Constitution was written, most states had recently written new constitutions of their own, so constitution-making was a well-known process. They all reflected the basic American political value of a Democratic Republic. Conservatives hail it as a great triumph. By 1785, newspaper essayists and petitioners in favor of national trade policies were demanding a vigorous, expanding, interdependent continental economy. They envisioned a national union whose primary purpose was to create a continental marketplace that could operate free of obstruction by contrived, and unnecessary, provincial entities. Washington spoke for many American nationalists dismayed at the national weakness and loss of national pride. He knew that the Revolution had nearly been lost because of the impotence of the national government; Washington feared that the nation might not be so fortunate during the next emergency. In the late 1780s, a crisis of self-confidence shook the new nation. Was its government strong enough to guarantee internal cohesion and to provide for the common defense against outside enemies (such as Britain and Spain), or indeed to defend against internal revolts (such as Shays Rebellion in Massachusetts, in 1786–87)? Other issues led to the Mount Vernon Conference, which was held in Washington's home. The nationalists met at the 1786 Annapolis Convention, which originated from a series of commercial meetings among the northeastern states. Some historians see it as an unsuccessful experiment in reforming the Articles of Confederation. Others emphasize that the nationalists at Annapolis, especially Alexander Hamilton of New York and James Madison of Virginia, used it to call for the Philadelphia convention. The Annapolis experience led Madison and the other nationalists to consider designing a new federal political system with a powerful central government. The report of the Conference, sent to Congress, requested "the appointment of Commissioners, to meet at Philadelphia on the second Monday in May next." Leading nationalists, led by Washington, Hamilton, and Benjamin Franklin called for a new constitution. The old Congress (based in New York) agreed and called the states to send delegates to a convention in Philadelphia in May 1787. This convention, over the course of the summer, drew up a new constitution that was submitted to Congress and eventually to state ratification conventions for approval. James Madison, who arrived in Philadelphia early to map out an initial plan for debate, is called "the father of the Constitution." Madison took copious notes of the debates, which he refused to release until the last delegate was dead; they were published posthumously. Political parties did not exist in 1787 and were not mentioned in the Constitution. In each state, factions competed for control of the legislatures and the governorships. Because the states controlled their representatives to Congress, a geographically based factionalism pitting the different states against one other existed in the Continental Congress. The factions in the different states had little in common; politics did not cross state lines and no coalitions were formed that crossed state lines. Many nationalists feared Congress was too weak. On 29 May when Edmund Randolph proposed to replace the current government with a totally new structure. Randolph's Virginia Plan favored large states (Virginia had the largest population at the time) and increased the power of the central government. In mid June, the smaller states responded with the New Jersey Plan, introduced by William Patterson. The convention debated the New Jersey option until 19 June, when it was voted down. Therefore, the Virginia Plan, much expanded and elaborated upon in the course of four-and-a-half months, formed the basis of the Constitution. Madison, more liberal than most of the delegates, is given the major credit for shaping the key provisions, but most of his proposals were actually defeated. Madison wanted broad national authority independent of state governments and population-based congressional representation. Delegates from smaller states opposed had other goals: to nationalize only selective public goods, to maintain most state policy autonomy, and to minimize contingencies imposed by other governments. Connecticut's delegates, particularly Roger Sherman, played a pivotal role in revising Madison's agenda. Madison's convention opponents are responsible for a Constitution that nationalized only enumerated public goods and imposed potentially high transaction costs on any further nationalization of policy authority. They helped make federalism a lasting political weapon used to win substantive policy outcomes, says Robertson. During the Convention, on August 22, 1787, the Delegates took a break to see John Fitch successfully demonstrate his 45-foot steamboat in the Delaware River between Pennsylvania and New Jersey. Fitch received a U.S. patent in 1791. Fulton began building boats in 1801, and in 1807 his boat the Clermont made its famous run up the Hudson from NYC to Albany. In general, many of the Founders preferred local Self-government, and during the debates quite often referred to the new government they were forming as a "general government" instead of a "national government". Additionally as one member (Sherman) noted, an importance for an equality of votes in the Senate was explicitly to preserve the states and give them a negative on the activities of the general government. Col. HAMILTON coincided with the proposition as it stood in the Report. He had not been understood yesterday. By an abolition of the States, he meant that no boundary could be drawn between the National & State Legislatures; that the former must therefore have indefinite authority. If it were limited at all, the rivalship of the States would gradually subvert it. Even as Corporations the extent of some of them as Virginia, Massachusetts, etc. would be formidable. As States, he thought they ought to be abolished. But he admitted the necessity of leaving in them, subordinate jurisdictions. The State's Rights advocates like George Mason wanted powerful state governments and did not want the national government to weaken those powers. Federalism was adopted, which provides a supreme, yet constricted general government with a small set of nineteen Enumerated powers, leaving the bulk of the remaining powers in the hands of sovereign states. On August 6th, the first appearance of the draft Constitution, the opening phrase "We the People" had not yet been fully developed. 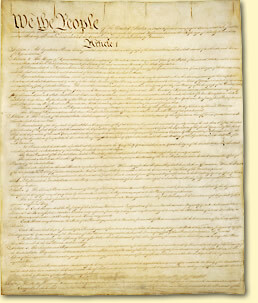 The final version refers to "We the People" of the "United States", but the original draft contained the names of all thirteen sovereign states and referred to "We the People" within those states. Slonin (2000) studies the debates on federal powers, including those on a federal legislative veto and the advice and consent of the Senate. He finds a complex interaction between contending interests and groups, as well as a discriminating response to the need to balance the requirements of the national government with the preservation of state influence. Nearly all areas of discussion at the convention were dominated by differences between the interests of large states and small states. The first outline of the national government reflected more of a compromise between the large and small states and between nationalists and those intent on maintaining states' interests than many Federalists preferred. Instead of Madison's vision of a national government freed from any reliance on states as seen in the Virginia Plan, the final version of the Constitution granted the states a substantial role and basic involvement in the operation of the national government. For a more detailed treatment, see Virginia Plan. The Virginia Plan proposed representation based on population, giving larger states more power than smaller states. It called for a bicameral legislature with a lower house elected from citizens of each state, and an upper house elected by members of the lower house. This legislature was able to veto laws passed by states. It was responsible to choose the national executive. The larger states supported this plan. For a more detailed treatment, see New Jersey Plan. The New Jersey Plan proposed a unicameral legislature with one vote per state, and a simple revision of the Articles. The smaller states supported this plan, as it gave them more power. For a more detailed treatment, see Connecticut Compromise. Also known as the Great Compromise, this established a bicameral legislature (Congress). The upper house (Senate) was to contain two votes per state, with Senators chosen by state legislatures. The lower house (House of Representatives) was based on population, with representatives chosen by the people. The Great Compromise also called for the Articles to be completely replaced. The presidency was not controversial. Six influential delegates worked out a system of a strong president to balance a strong Congress. The result was four basic characteristics became permanent: a single executive (rather than a committee or rotation), no constitutional council whose permission was necessary, election by the states through the electoral college, and broad presidential powers over administration, foreign affairs, the military. The Constitution was written at a time when all the northern states were moving toward emancipation, and most leading southerners doubted the long-term viability of the institution. The Constitution did not use the word "slavery", but it allowed for the abolition of slave importation from abroad after 20 years, for the return of fugitive slaves, and for counting 3/5 of the slave population (and all of the free population) in computing representation in the House and electoral college. That was a compromise between counting all the slaves (which would favor the South) or none (which would favor the North). Benjamin Franklin helped broker the compromises. Grubb (2006) argues the monetary powers embedded in the Constitution were revolutionary and led to a watershed transformation in the nation's monetary structure. They included determining what monies could be legal tender, who could emit fiat paper money, and who could incorporate banks. Grubb looks at the convention debates to show how these powers evolved and led to the specific powers adopted, which were a rejection of the old colonial system. Grubb shows they codified the powers into supreme law rather than leaving them to legislative debate and enactment. An intense debate on ratification pitted the "Federalists" against the "Anti-Federalists," with the former gaining the upper hand. The Anti-Federalists were deeply concerned about the theoretical danger of a strong central government (like that of Britain) that some day could ruin Republicanism and usurp the rights of the states. Madison and Hamilton (joined by John Jay) countered with a series of newspaper essays, the Federalist Papers, that helped New York to ratify. All the states ratified but as a condition, the Anti-Federalists insisted on a bill of rights which would meet most of their serious objections. The supporters of the Constitution agreed (and the Bill of Rights became part of the Constitution in 1791). The Anti-Federalist element had never comprised an organized group, and had no national leaders. By 1791 its issues were moot; some left politics, and most joined the Jeffersonian Republican Party by 1796. The pro-Constitution forces, led by Washington and Hamilton, formed a new government in 1789, with Washington as president. Madison became a leader in the House, where he sponsored the Bill of Rights. Under pressure from his district he resisted moves toward a strong central government, especially those promoted by Hamilton. The Federalist Party originated around 1792-3 and comprised a somewhat different coalition, including most supporters of the Constitution in 1787-88 as well as entirely new elements, and even some opponents of the Constitution (such as Patrick Henry.) Madison largely wrote the Constitution and thus was a "Federalist" in 1787-88, but by 1792 he opposed the program of the Hamiltonians and their new "Federalist Party." According to the debate notes taken by James Madison: Of the fifty six delegates, only forty seven had noticeable speaking roles. The remaining nine contributed in other ways, such as secretary, committee roles, voting for measures, or Washington's position as President of the Convention. Madison's notes are the primary source of knowledge for understanding of what exactly happened at the convention over the course of those months. Other note-takers include Robert Yates, Rufus King, and William Pierce. The notes of these three confirm the accuracy of Madison's notes. The majority of the speeches and debating come from Founders Gouverneur Morris, Elbridge Gerry, Charles Pinckney, James Wilson, George Mason, John Rutledge, Edmund Randolph, and James Madison himself. ↑ Ferling; A Leap in the Dark p 258-9. ↑ Morris (1987) pp 267-97. ↑ Farrand (1911) p xv. The implication is that Madison did not want commentators using his notes to discover what the delegates meant by various provisions. ↑ McDonald, (1965), pp 17-32 on Congress; pp 33-132 covers each state. ↑ The phrase "general government" appears in the transcript of Madison's Notes of the convention 34 times, and "national government" is explicitly struck out twice. ↑ Madison Debates July 14, "Mr. SHERMAN urged the equality of votes not so much as a security for the small States; as for the State Governments which could not be preserved unless they were represented and had a negative in the General Government." ↑ The Principles of Constitutional Government: Political Sovereignty, "Hamilton's proposed plan called for the subjugation of the States. He candidly confessed that he would prefer to abolish the states completely, but was willing to tolerate their existence if they could be controlled completely by a centralized government." ↑ Madison Debates, August 6, We the people of the States of New Hampshire, Massachussetts, Rhode-Island and Providence Plantations, Connecticut, New-York, New-Jersey, Pennsylvania, Delaware, Maryland, Virginia, North-Carolina, South-Carolina, and Georgia, do ordain, declare, and establish the following Constitution for the Government of Ourselves and our Posterity. ↑ George Washington, Alexander Hamilton, James Madison, Rufus King, James Wilson, and Gouverneur Morris. ↑ In 1808 Congress made the importation of a slave from abroad a serious crime. Britain at the same time outlawed the international slave trade; a small trickle of slaves were smuggled into the U.S. Edward Channing, The Jeffersonian System, 1801-1811 (1906 100-110. ↑ Morris The Forging of the Union: 1781-1789 pp 298-322. ↑ For a good review and refutation of conspiracy theories, see Dr. Curtis E. Grassman, "Conspiracy and the Making of the Constitution" online which concludes, "The various conspiracy theses have not been very convincing. The historical proof or evidence offered by this school of historians has almost always been found wanting upon further investigation." ↑ The Journal of the Debates in the Convention Which Framed The Constitution of the United States, May-September, 1787, The notes of Yates, King, and Pierce are the only unofficial record of the convention extant, besides Madison's, and their chief value is in connection with the Madison record, which in the main they support, and which occasionally they elucidate. Delegates to the Constitutional Convention by State, those who signed the Constitution are indicated by italic. The legislature of Rhode Island declined to send delegates to the Convention. This page was last modified on 26 September 2018, at 09:59.